Enduring the suicide of his teenage son, the dissolution of his marriage, and the aggravation brought on by incompetent supervisors has only made him better at what he does. When set to launch a major investigation into the Bronx heroin czar, a man called the Nasty One, the hierarchy of the NYPD insists on interfering. Caleb packs up his twenty plus years of service and retires. Walking away from life as a cop turns out to be the least of his problems, as he now finds himself alone, unchallenged, and hearing uncompromising voices. Battling for a new purpose in life, he connects with his old friend and colleague Sergeant James Paul McCormack. The Sergeant is under intense pressure to find a killer who has been decorating New York City with dead women, displayed in acts of vulgarity. 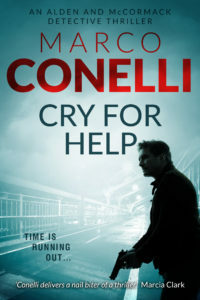 When he confides in Caleb, the retired detective discovers a heroin connection that may lead to the murderer’s identity and agrees to help. As Caleb starts receiving cryptic religious symbols in the mail, he can’t help but wonder if it’s a cry for help in the form of divine intervention, or a message from a killer who wants to see New York burn!